Posted on February 28, 2012	by Katy K.
Thanks to my colleague S. for pointing out this one! Also, I’m trying a bigger picture size to see if Pinterest will see it. Let me know if it makes things too slow to load for you. 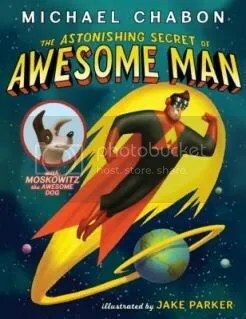 The Astonishing Secret of Awesome Man by Michael Chabon. Illustrated by Jake Parker. Awesome Man himself takes through a day in the life of… Awesome Man. He describes his costumes, his powers (the “Awesome Power Grip,” aka hugging), and his sidekick dog, Moscowitz. We see Awesome Man beating villains like Radioactive Jell-o from Outer Space and Dr. Von Evil. And then, alas, Awesome Man is beaten by his arch nemesis. He must flee to his secret fortress, a small patch of suburbia in an undersea bubble. After some deep reflection huddled on his bed, Awesome Man realizes that the problem is that he’s out of positrons. He needs to eat to regain his strength! But once on the job again, will he ever stop long enough to reveal his secret identity to the reader? The ending is undeniably sweet. The bright, smooth pictures have occasional retro-feeling dot fills, giving a hint of old-school comics. There are just enough details to let you discover new details in subsequent readings. This is ideal for superhero-obsessed preschoolers and early elementary kids, with just the right blend of action and innocence. This entry was posted in Uncategorized and tagged picture books, superheroes. Bookmark the permalink.